Carefully examining rather meager documentation and listening to slightly faded memories of former football stars and club executives, we assembled equally reliable data, facts, dates, results and achievements, painting a realistic picture of early post-WWII football days, starting from 1944 when the most beautiful game attracted great number of football players and tens of thousands of football aficionados. In those early days of freedom, youngsters turned mostly to football game in their spare time. 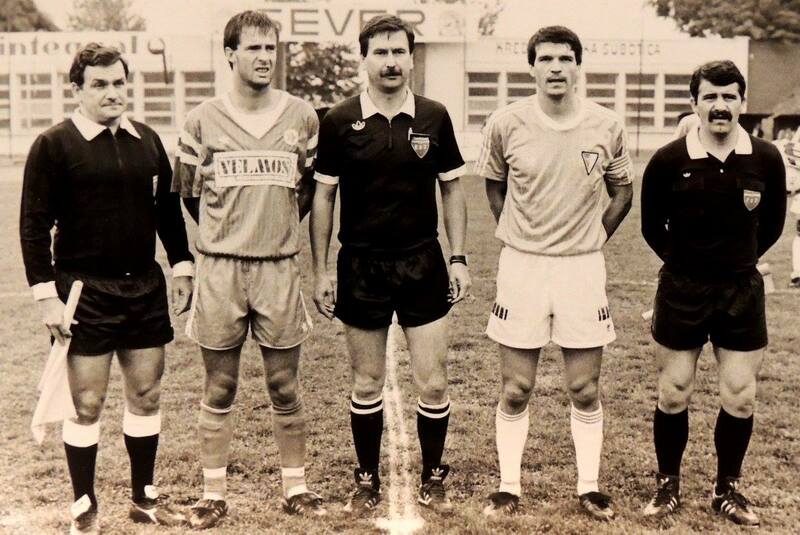 Early friendlies were played by ZAK as well as Gradjanski (Croatian Sports Society) and Jedinstvo (Workers Exercise Society). 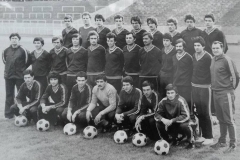 Later on, these teams would change their names – ZAK players joined football section of FOSD Jovan Mikic-Spartak to form FK Spartak, while in June 1946 Jedinstvo changed its name to Radnicki followed by 22nd of January full sports association merger with FOSD Jovan Mikic-Spartak. 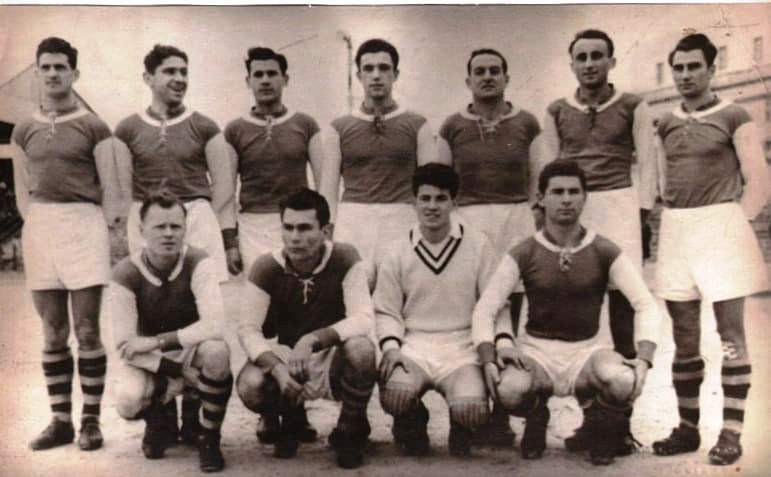 Gradjanski was founded on 7th of March 1946 but soon changed its name to Sloboda followed by 6th of April 1949 emergency assembly meeting which led to disbandment of the club whose members soon joined FOSD Jovan Mikic-Spartak. 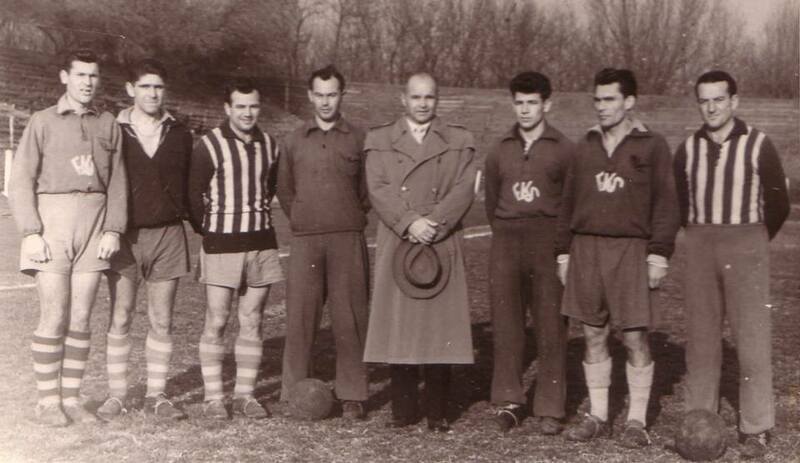 Above-mentioned clubs and military units teams stationed in Subotica participated in early post-WWII matches. 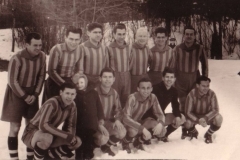 First official game was played on 10th of December 1944 between Subotica A and Subotica B team. A team won 4-2. 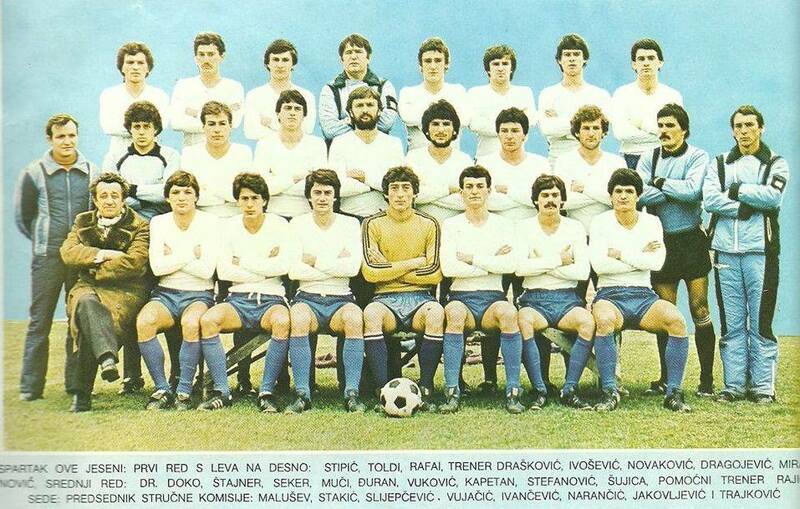 A week later, on 17th of December, Subotica team beat ZAK 3-0 followed by a number of other matches – ZAK – Radnicki Novi Sad 8-1 win and 8-2 return leg win, ZAK – Belgrade Brigade 1-1 and ZAK – Crvena Zvezda 2-4. Some teams engaged in one tournament as well and the results were as follows: Command Posts – Command Areas 2-3, Command Areas – Hospital Centre 2-2, Command Areas – People`s Militia 5-2. 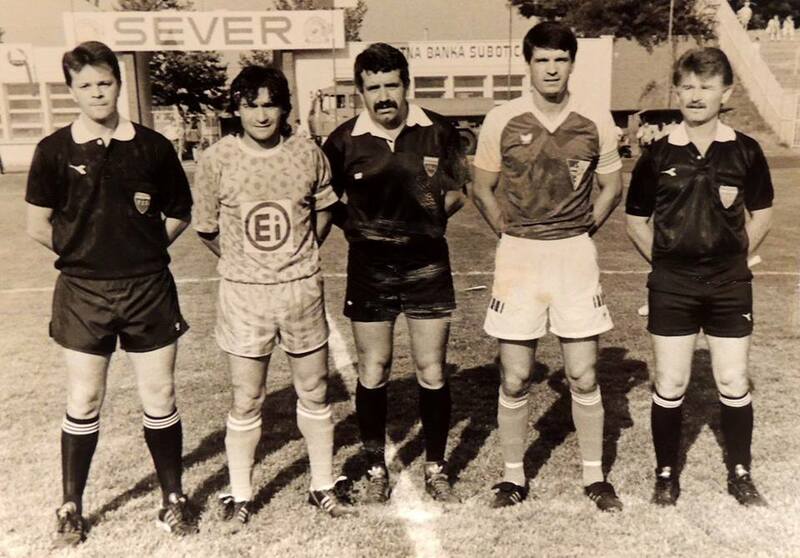 All proceedings from this tournament were donated to Hospital Centre for the needs of military hospitals. 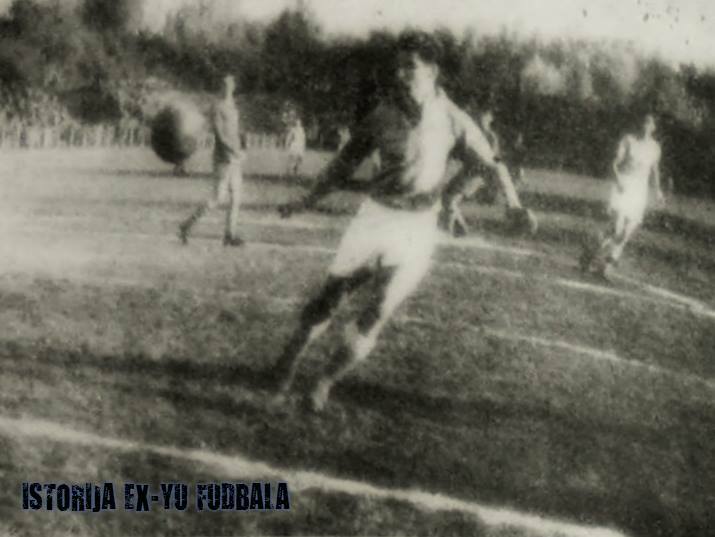 Beginning of April 1945, ZAK players started their tour of Serbia and Vojvodina region under the name of Subotica. On the 8th of April, they won Engineering Brigade team 8-0 in Belgrade, with goals scored by Palfi (4), Hatvani (2), Sabanov (2), Prcic and Njers. Two days later, on 10th of April, 4-0 win against Radnicki Belgrade was achieved, with brace from Prcic and goals from Njers and Janjic. 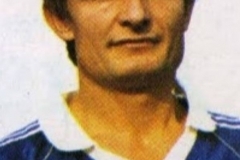 Subotica won Radnicki in Kragujevac 8-0, Krusevac and Pancevo away 5-1 and 4-0 respectively. 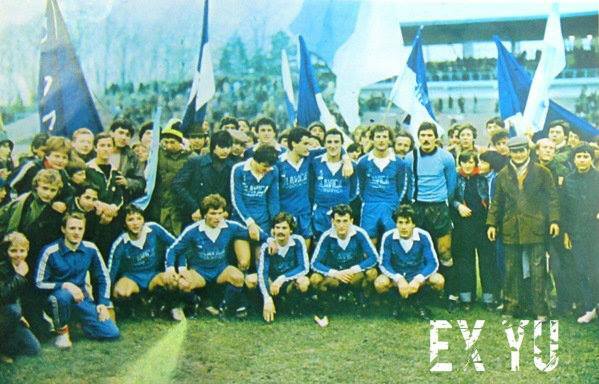 Upon arrival to Zrenjanin, team received telegram from Subotica stating that team must abandon their tour and return home immediately. 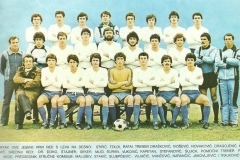 Subotica players on this tour were as follows: Pajo Simokovic, Miroslav Beleslin, Lazar Bogesic, Janko Zvekanovic, Lajco Jakovetic, Gojko Janjic, Ilija Vorgucin, Bela Palfi, Stipan Kopilovic, Joska Takac, Karlo Neorcic, Josip Prcic, Blasko Milunovic and Zeljko Sabanov. 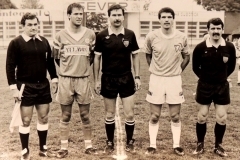 As ZAK players were not able to perform under their club`s name any more, recently founded Gradjanski and Radnicki showed interest in bringing them over to their respective clubs, as well as FOSD Jovan Mikic-Spartak whose sports association reached a decision to form a football club as well. Meanwhile, ZAK players kept training and talked about which club should they join. 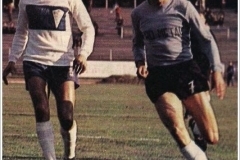 In a most democratic manner, players agreed to join the club most of them decide to vote for. The act of voting took place at Marija Letic-Budzinica café, Ivan Milutinovic Street, mid-April 1945. Present along with ZAK players were Gradjanski and Radnicki representatives while FOSD Jovan Mikic-Spartak was represented by Rastivoj Sibalic, Miran Ostan and Aleksandar Zvekan. 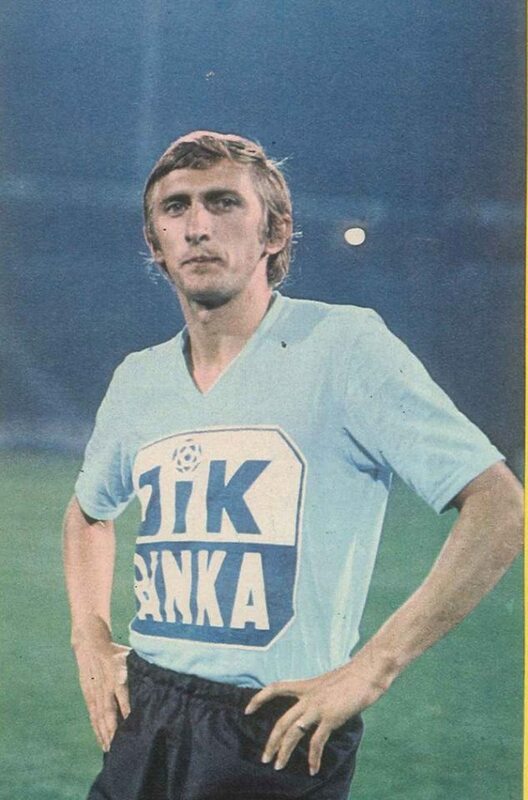 Following ZAK players attended the voting: Stipan Kopilovic, Gojko Janjic, Lajco Jakovetic, Lazar Bogesic, Blasko Milunovic, Pajo Simokovic, Janko Zvekanovic, Joska Balaz, Djusika Balaz, Karlo Neorcic, Josip Prcic, Ivan Latki, Ilija Vorgucin, Joska Takac, Kalman Delic, Miroslav Beleslin, Ivan Bogesic and Nikola Aradski. 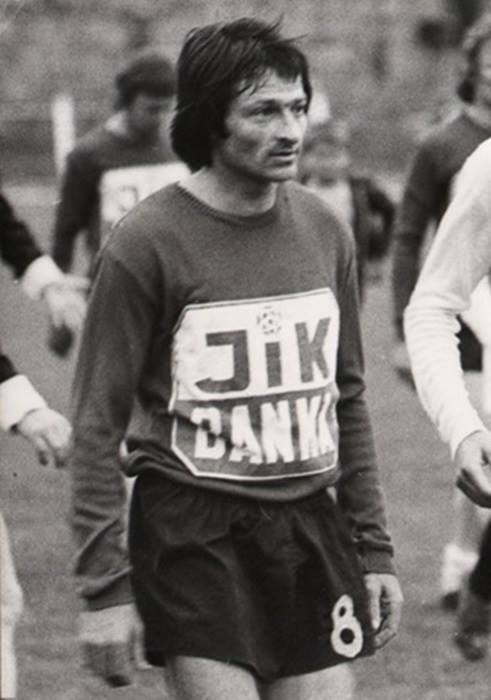 Decision made was announced to clubs by Gojko Janjic, the oldest of all ZAK players. 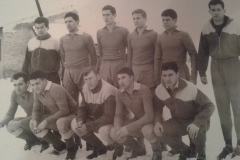 All now-former ZAK players decided to join FK Spartak and on 21st of April 1945 they started wearing blue-and-white Spartak colours officially. 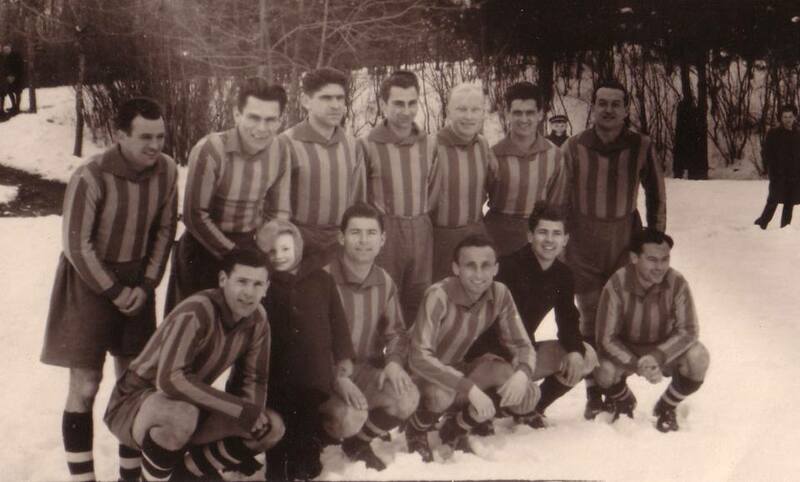 In autumn 1945 and spring 1946 Spartak players, already regarded great football maestros, play a number of matches, taking part in North Backa League and trying to earn as great reputation as possible for their new club. 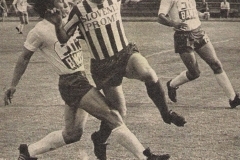 Besides Spartak, North Backa League consisted of Jedinstvo Backa Topola, Gradjanski Subotica, Radnicki Bajmok, Jedinstvo Senta, Sloga Sombor, Jedinstvo Subotica and Radnicki Sombor. Spartak won the league and consequently took part in top-tier qualifiers, a two-legged tie against Vojvodina. 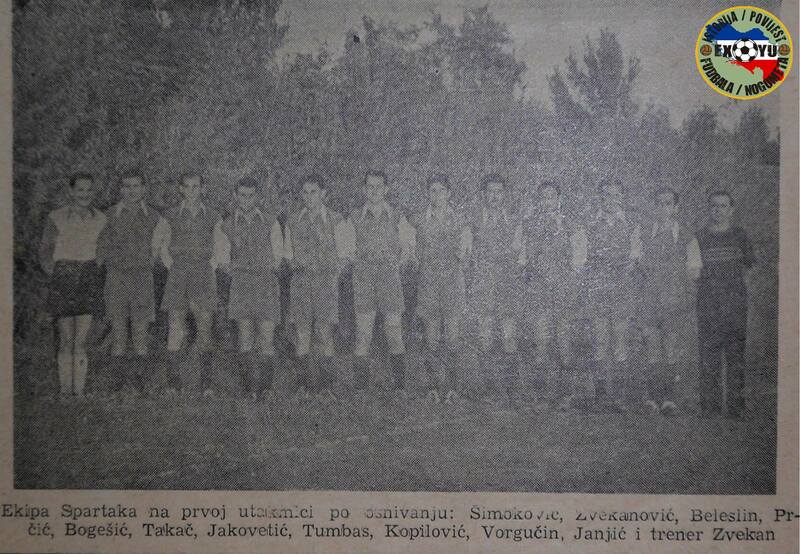 Matches were played on 14th and 21st of July 1946 and Spartak one both encounters 2-0 in following line-up: Pajo Simokovic, Ivan Bogesic, Miroslav Beleslin, Lajco Jakovetic, Janko Zvekanovic,Gojko Janjic, Ilija Vorgucin, Ladislav Tumbas, Stipan Kopilovic, Joska Takac and Josip Prcic. 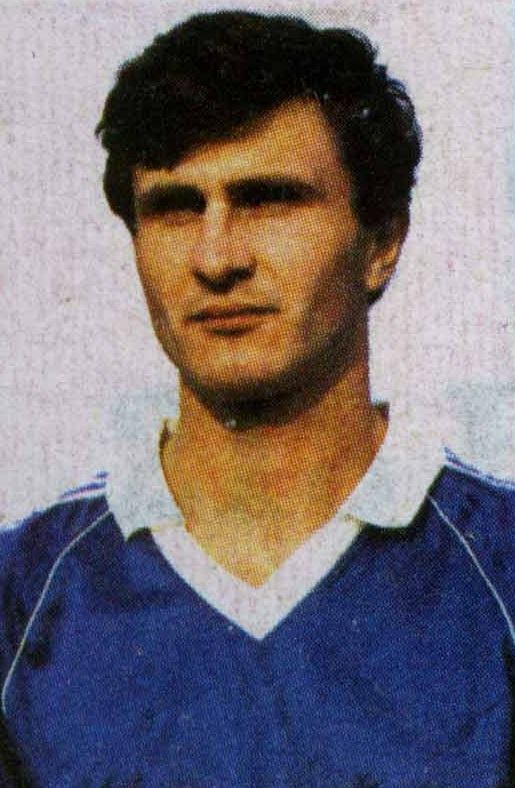 Goals at home were scored by Joska Takac and Josip Prcic, while Ladislav Tumbas and Josip Prcic scored away in Novi Sad. 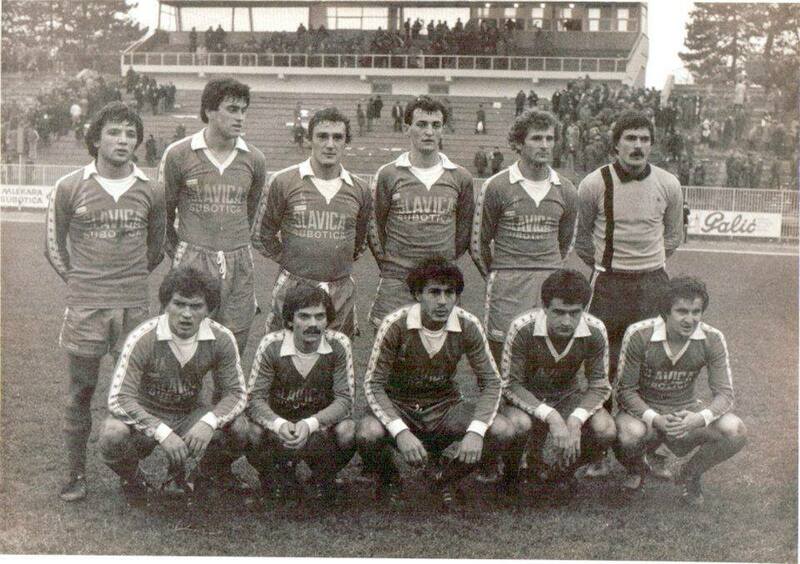 After successful qualifiers, Spartak won the right to compete in top-tier of Yugoslav football. 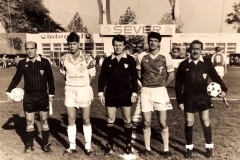 Other participants of the league were: Partizan, Crvena Zvezda, Metalac Beograd, Dinamo Zagreb, Lokomotiva Zagreb, Hajduk Split, Pobeda Skopje, Kvarner Rijeka, Buducnost Titograd, Ponziana Trieste, Zeljeznicar Sarajevo, 14th October Nis and Nafta Donja Lendava. 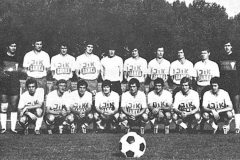 Over the course of club`s history, Spartak played four more qualifiers. 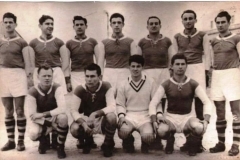 In 1951, Spartak played play-out qualifiers to regain top-tier status, playing three games against Odred Ljubljana. All three matches ended in a stalemate, 3-3 in Subotica, 0-0 in Ljubljana and 2-2 in Zagreb. After a total of 300 mins played, a coin toss helped Spartak remain top-tier contender. 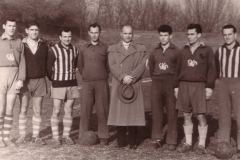 In 1952 play-out qualifiers, Spartak played against Radnicki Obrenovac (6-2, 6-0), Napredak Krusevac (5-1, 4-0) and Dinamo Pancevo (1-1, 2-0). 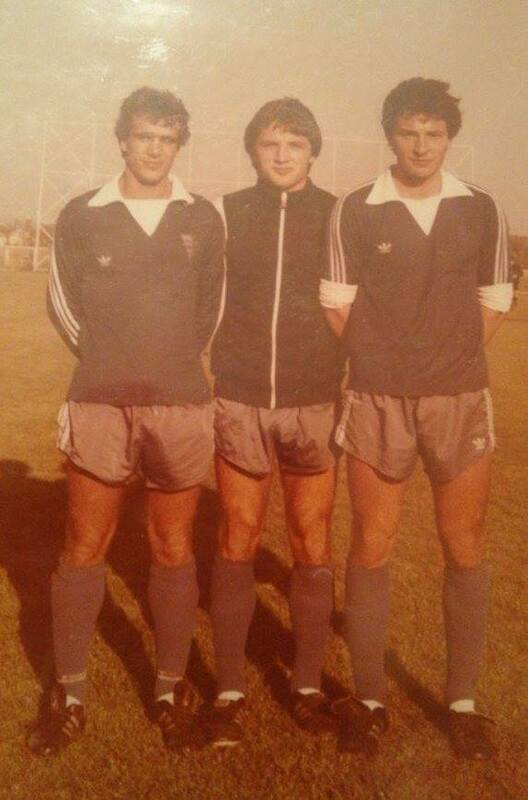 This was regarded as a success for the young side of Spartak led by Josko Takac and standout players Beta Futo and Antun Rudinski, the latter becoming Crvena Zvezda and Partizan forward respectively. 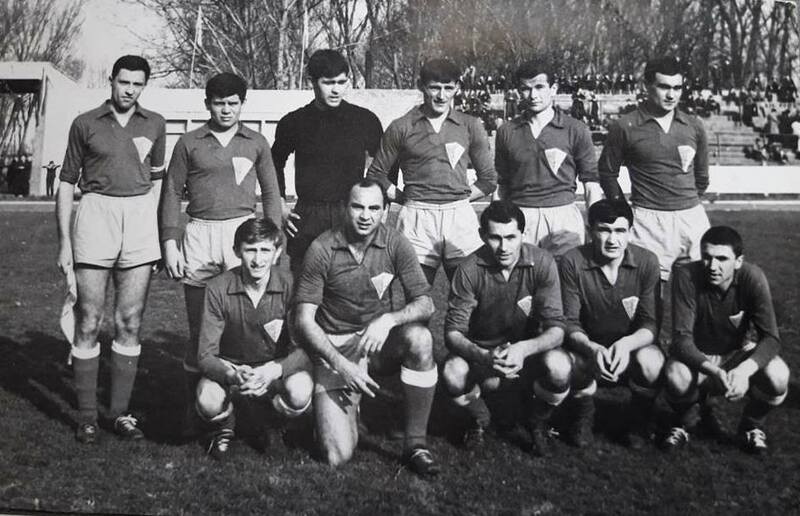 After being relegated from top-tier in 1958, Spartak had another play-out opportunity locking horns with Rijeka and Napredak Krusevac. Spartak won Napredak 2-1 and 6-0 but got relegated afer a 3-0 defeat and 0-0 draw against Rijeka. 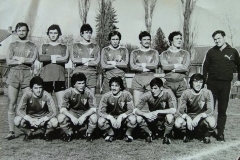 In 1972, as champions of second-tier North, Spartak played qualifiers against Rudar Ljubija (2-2, 3-1) and Buducnost Titograd (0-1, 2-1). After 2-2 agg score against Buducnost, Spartak won penalty shoot-out 6-5 and achieved top-tier football once again. 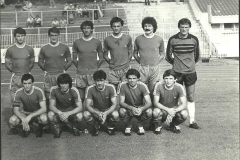 Spartak scorers from the spot were: Gasic, Cetina, Jurkovic, Culafic, Birovljev and Radosav. 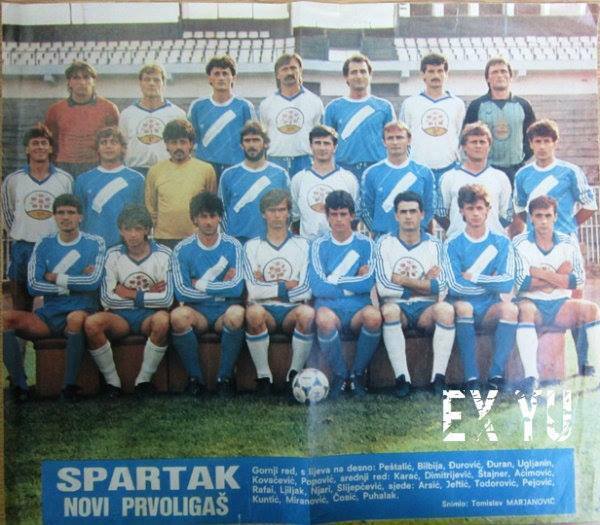 Playing in various leagues (North Backa regional, Yugoslav top-tier, North, West and East second-tier and Vojvodina region third-tier) Spartak achieved following final standings positions: 1945/1946 season (North Backa League, champions), 1946/1947 (top-tier, 6th place), 1947/1948 (top-tier, 10th place), 1948/1949 (second-tier, 3rd place), 1950 (top-tier, 9th place), 1951 (top-tier, 11th place), 1952 (second-tier, Vojvodina region, champions), 1952/1953 (top-tier, 10th place), 1953/1954 (top-tier, 6th place), 1954/1955 (top-tier, 8th place), 1955/1956 (top-tier, 9th place), 1956/1957 (top-tier, 12th place), 1957/1958 (top-tier, 12th place), 1958/1959 (second-tier, East, runners-up), 1959/1960 (second-tier, East, 5th place), 1960/1961 (second-tier, East, 6th place), 1961/1962 (second-tier, East, 9th place), 1962/1963 (second-tier, East, 8th place), 1963/1964 (second-tier, East, 12th place), 1964/1965 (second-tier, East, 8th place), 1965/1966 (second-tier, East, 8th place), 1966/1967 (Second-tier, East, 5th place), 1967/1968 (second-tier, East, 12th place), 1968/1969 (second-tier, North, 10th place), 1969/1970 (second-tier, North, 11th place), 1970/1971 (second-tier, North, 3rd place), 1971/1972 (Second/tier, North, champions), 1972/1973 (top-tier, 17th place), 1973/1974 (second-tier, West, 15th place), 1974/1975 (third-tier, Vojvodina region, champions), 1975/1976 (second-tier, West, 9th place), 1976/1977 (second-tier, West, 18th place), 1977/1978 (third-tier, Vojvodina region, champions), 1978/1979 (second-tier, West, 8th place), 1979/1980 (second-tier, West, runners-up), 1980-1981 (second-tier, West, 5th place), 1981/1982 (second-tier, West, runners-up), 1982/1983 (second-tier, West, 4th place), 1983/1984 (second-tier, West, runners-up). 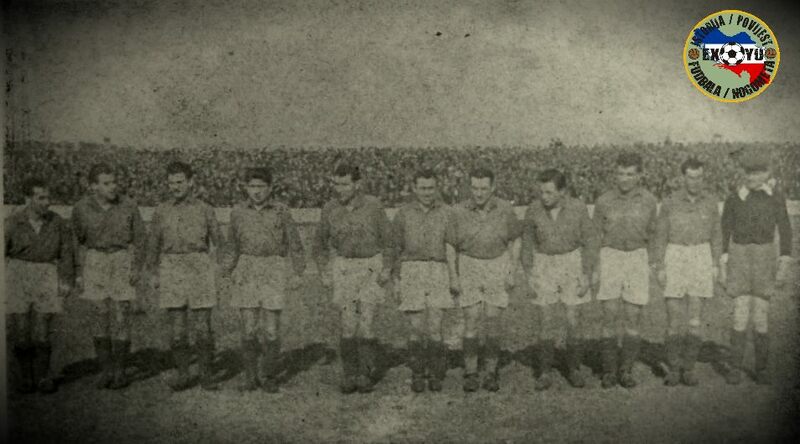 Spartak played first ever top-flight game on 26th of August 1946 in Subotica, in attendance of 4000 spectators. 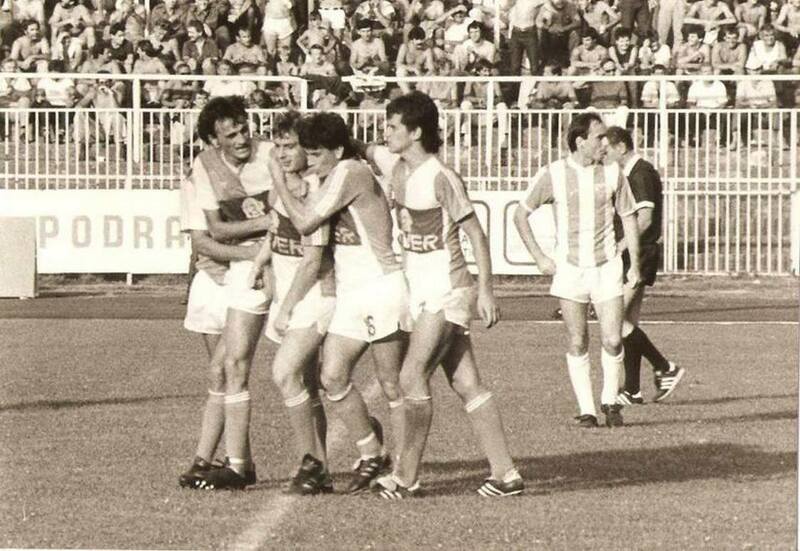 Crvena Zvezda defeated home side 3-1. 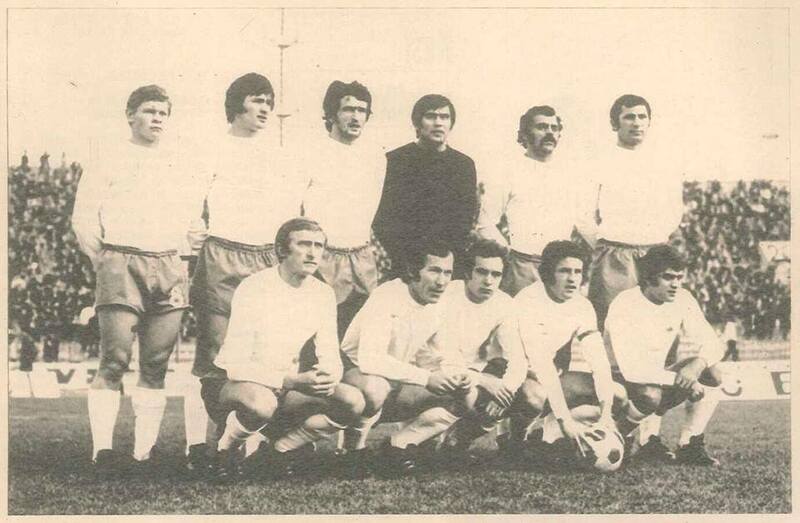 Spartak line-up was as follows: Milunovic, Ivan Bogesic, Beleslin, Jakovetic, Zvekanovic, V Harangozo, Vorgucin, L Tumbas, Kopilovic, Takac and Balaz. 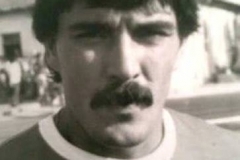 First ever top-tier goal for Spartak was scored by Harangozo who later became a well-known table tennis player. 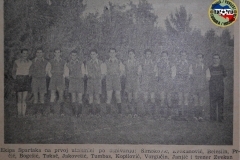 First ever-top-tier win was achieved on 8th of September 1946, a 4-0 win against Lokomotiva Zagreb, with goals from Takac, Prcic, Jakovetic and Gemeri. 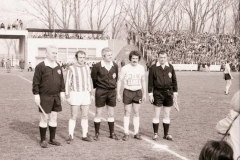 Three thousand spectators watched the following Spartak line-up play: Simokovic, Kopilovic, Beleslin, Jakovetic, Zvekanovic, Janjic, Tumbas, Takac, Prcic, Gemeri and Vorgucin. 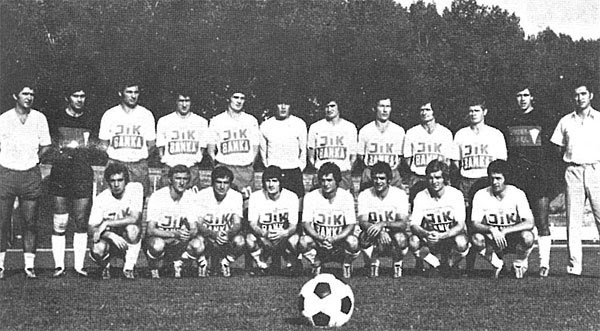 Spartak played their last top-tier games of the 70s in the 1972/1973 season, being relegated to second division as 17th placed. 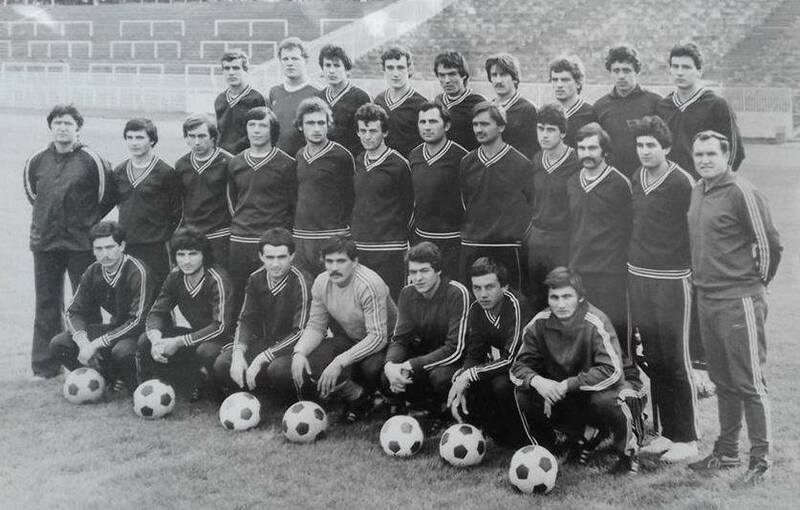 Spartak squad in 1972/1973 season: Djordje Zaklanovic, Ernest Kovacevic, Mihalj Djolai, Slobodan Bracanovic, Cedomir Terzic, Bozidar Gasic, Drago Jovicevic, Milos Cetina, Vinko Ilovac, Dusan Jurkovic, Mihalj Jezevic, Radivoj Radosav, Radivoj Birovljev, Stevan Birovljev, Ivan Budanovic, Slobodan Kustudic, Sead Sofic, Vladimir Culafic, Stevan Mrzic, Petar Gvozdenovic, Zivko Kojic, Ante Hamersmit and Imre Futo. 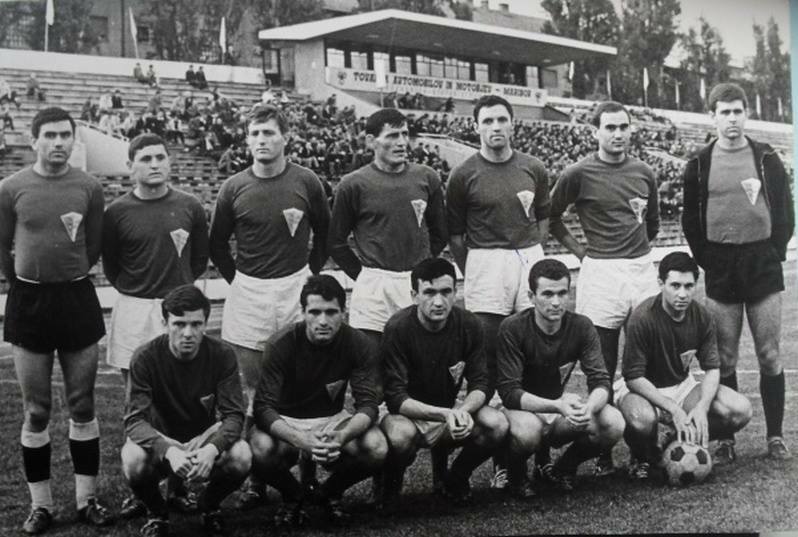 Spartak had best top-tier run in a period between 1953 and 1958. Spartak is regular feature in national cup competition. 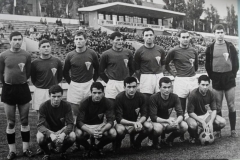 Back in 1962, our club played national cup final but lost 4-1 to OFK Beograd. 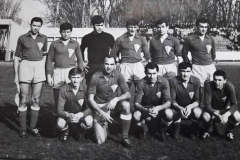 Previously, Spartak reached last 8 stage of the competition losing to BSK Beograd 2-3 in 1953 but in 1954 and 1955 Spartak reached cup semi-finals by beating Macva Sabac 5-0 and Vojvodina 2-0 respectively. 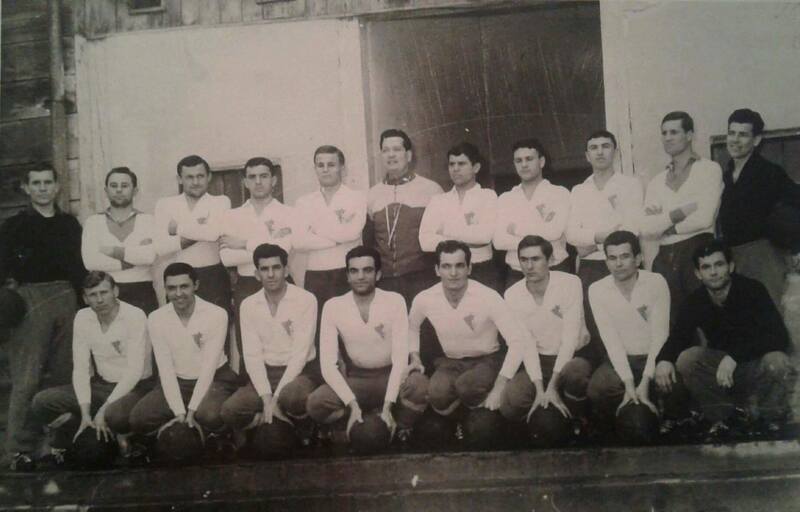 In 1954 semi, Spartak lost 1-0 to Crvena Zvezda while in 1955 our club suffered 2-0 defeat in the hands of Hajduk Split. 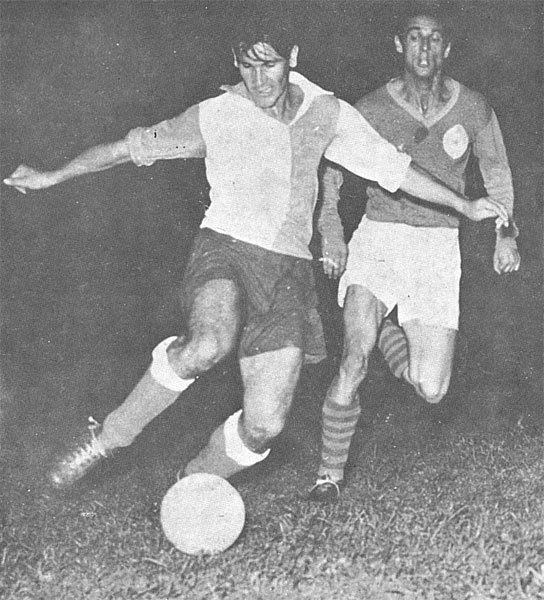 1962 semi-final encounter against Crvena Zvezda was regarded as “great game worthy of a cup final”. Spartak was praised for heroic performance and 4-3 win after extra-time. Even to this day, this match is regarded as one of most beautiful and exciting cup encounters ever played, It had it all – football quality, fighting spirit, great moves, extra-time, penalties and penalty saves. Eight thousand spectators in Subotica watched following Spartak line-up play: Tausan, Bleskanj, Copic, Jenovai, Cuckovic, Djukanovic, Takac, Hirsman, Terzic, Maravic II and Savkovic. 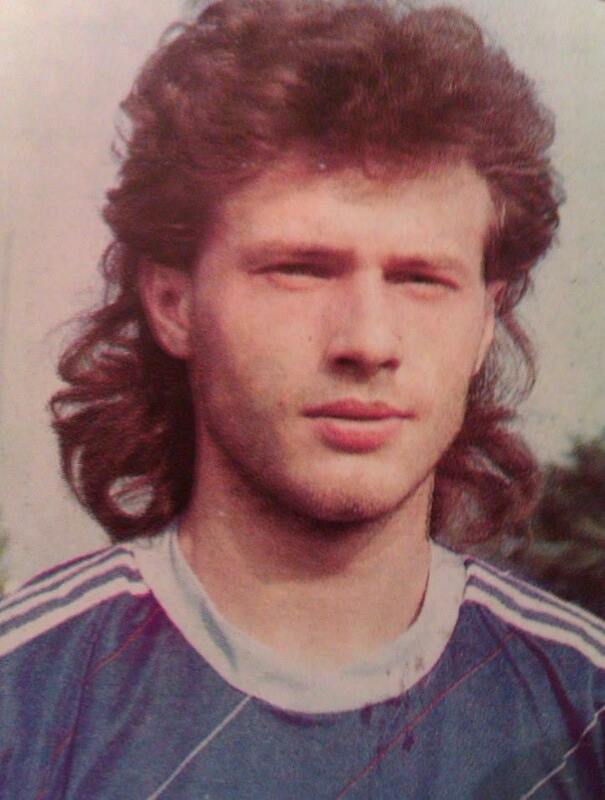 Spartak golas were scored by Tomic (og), Terzic and Hirsman (2). 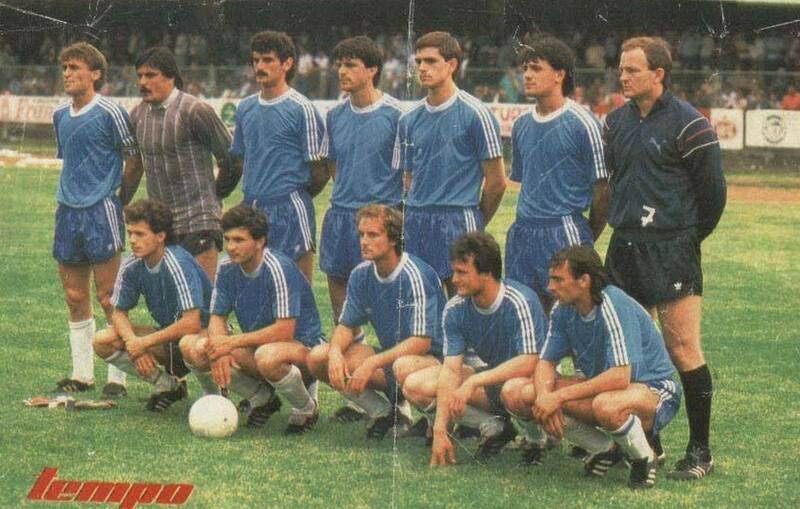 Crvena Zvezda line-up: Vukicevic, Tomic, Milicevic, Malesevic, Durkovic, Popovic, Stipic, Skrbic, Mlosevic, Sekularac, Melic. 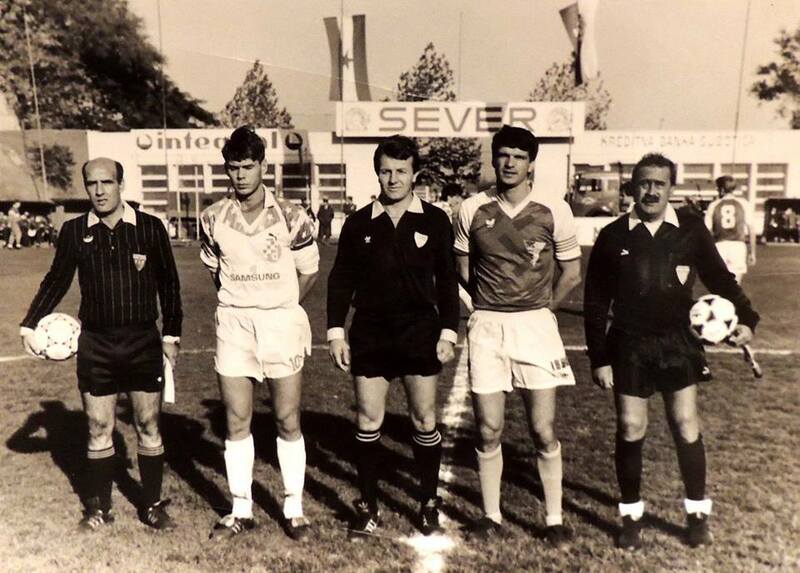 Crvena Zvezda goals were scored by Stipic, Milosevic and Melic.Match referee was Tesanic from Varazdin, while man of the match award could equally go to Tausan, Hirsman and Maravic II from Spartak. 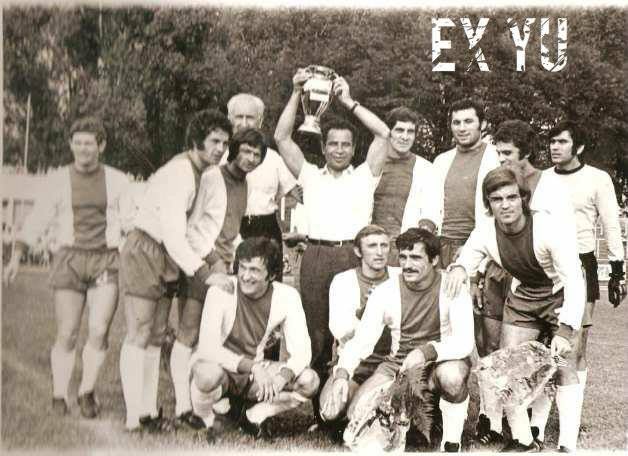 There are numerous games in Spartak competitive history that Spartak fans and football aficionados remember to this day. 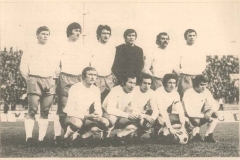 Spartak managed home wins against all so-called “ Big Four” of Yugoslav League: Crvena Zvezda 2-0, Partizan 2-1, Hajduk 4-1 and Dinamo 6-2. 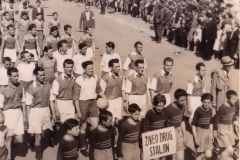 Out of all big and important games, Subotica football pundits and fans have the fondest memories of 12th of May 1956 6-2 win over Dinamo Zagreb. 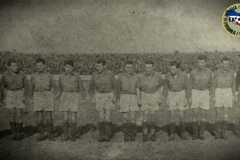 In front of ten thousand fans, Spartak inflicted one of the heaviest defeats ever on Dinamo Zagreb. 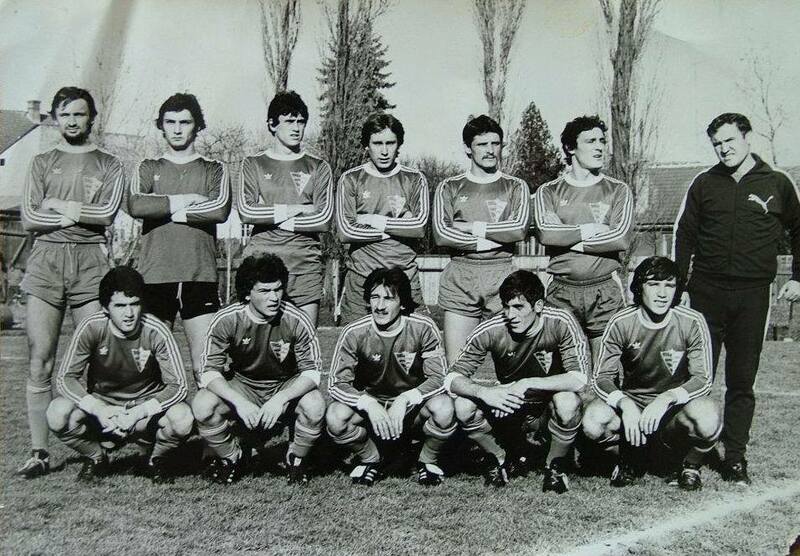 This was Spartak line-up back then: Prvulovic, Tapiska, Bogesic, Jakovetic, Stefanovic, Kujundzic, Branisavljevic, Jenovai, Ognjanov, Leskov and Copic. 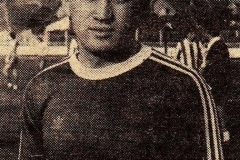 Ognjanov scored four goals along with one each from Leskov and Copic. 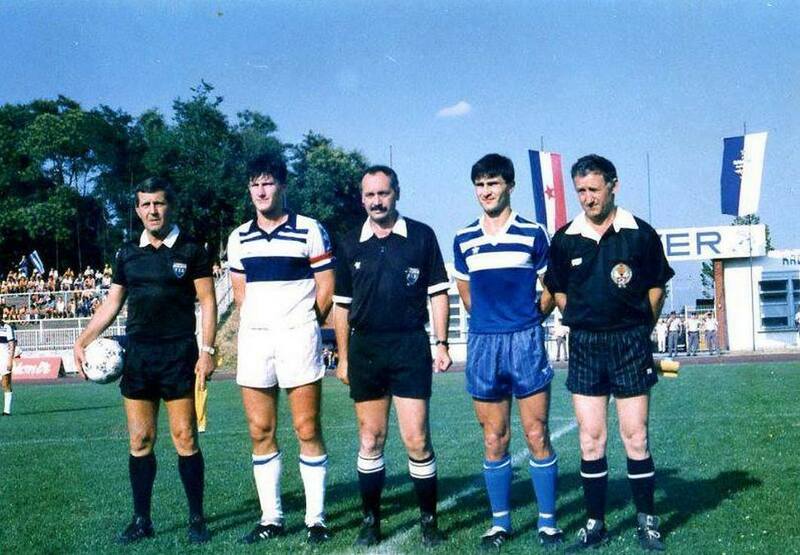 Many would say this was the best ever performance from Tihomir Bata Ognjanov, who scored four spectatular goals and troubled his national team teammates from Dinamo, Ivica Horvat and Tomislav Crnkovic, all the way through. 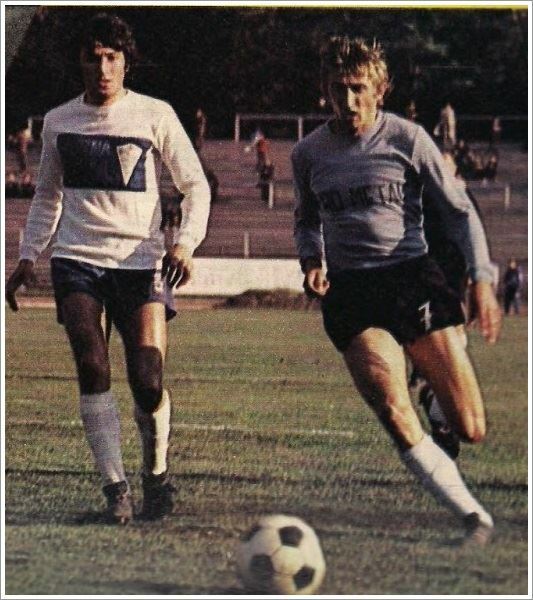 Another game against Dinamo stood out as well. Unfortunately, for all the wrong reasons. 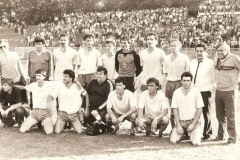 It was the final day of 1958 season and late Dinamo equalizer led to Spartak`s relegation to second-tier. Besides playing in domestic competitions, Spartak often ventured abroad or hosted well-knoiwn clubs from other countries. 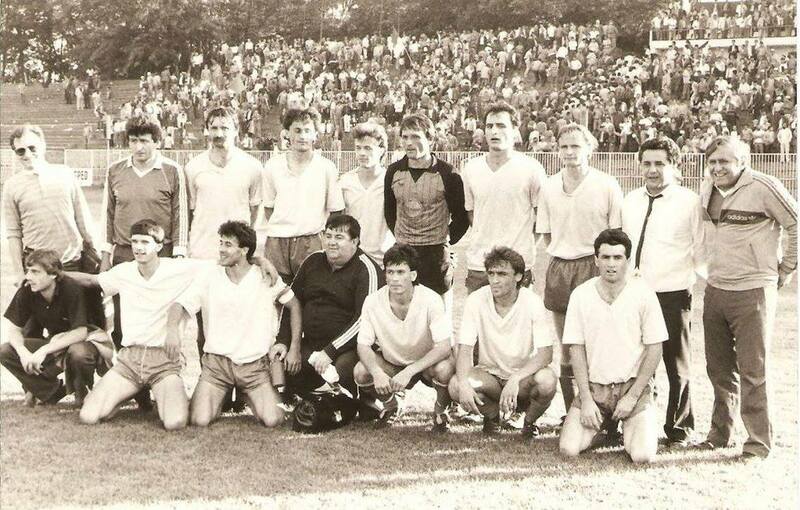 Spartak players and football fans have a fond memories of numerous tours and games. France and Malta tours of 1953 are among the most famous ones. Spartak played four games in France and six more in Malta without suffering a single defeat. 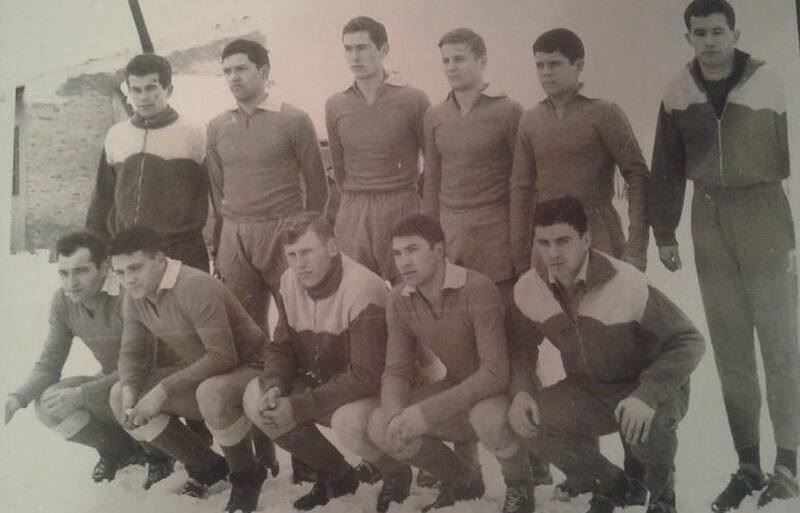 In 1956, Spartak was one of the few Yugoslav clubs of the era who visited Great Britain. 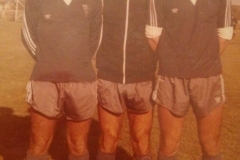 Our club played three friendlies, 1-3 defeat to Hull City, 1-2 defeat to Lincoln and 1-3 defeat to Fulham. Besides hosting best clubs from Hungary and Romania, Spartak played home friendlies against Stutgart Kickers (4-2 win), Sturm Graz (5-1 win) and Ankaragucu (2-2 draw). 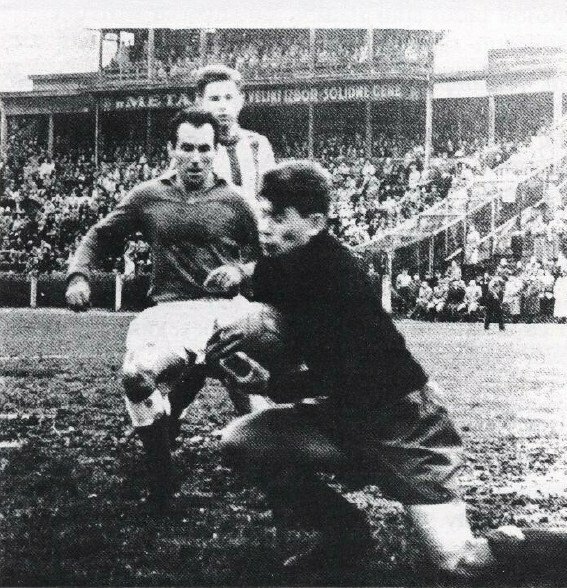 In 1952 Germany tour, Spartak also defeated Bayern Munich 1-0. 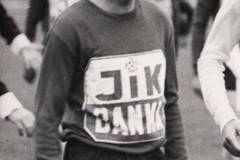 Famous wins include 2-1 defeat of Honved and Maccabi Tel Aviv 2-1 win, while 4-4 draw against Honved is also one to remember. 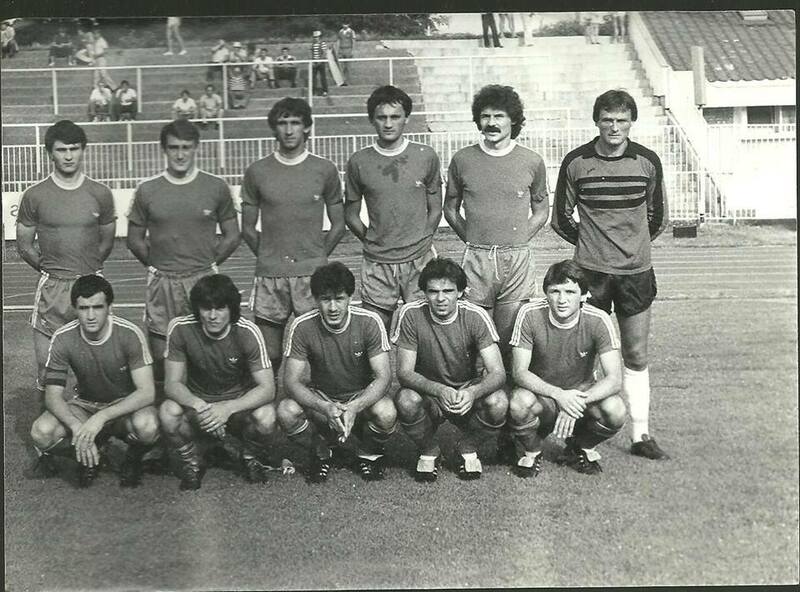 All Spartak foreign tours, especially those in the first two decades since the club was founded, did a lot for promotion of Subotica and Yugoslav football game. 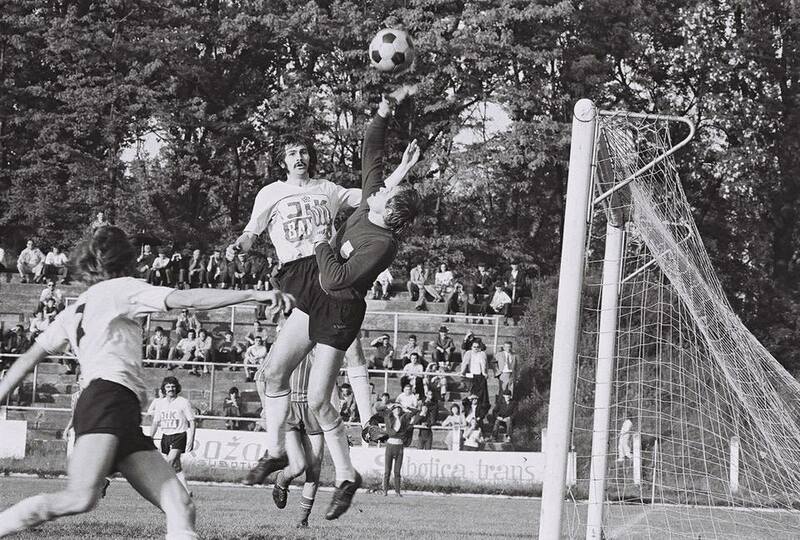 Over the years, Spartak played in Great Britain, France, Malta, Greece, Hungary, Romania, Austria, West and East Germany, Sweden, Norway and Finland. 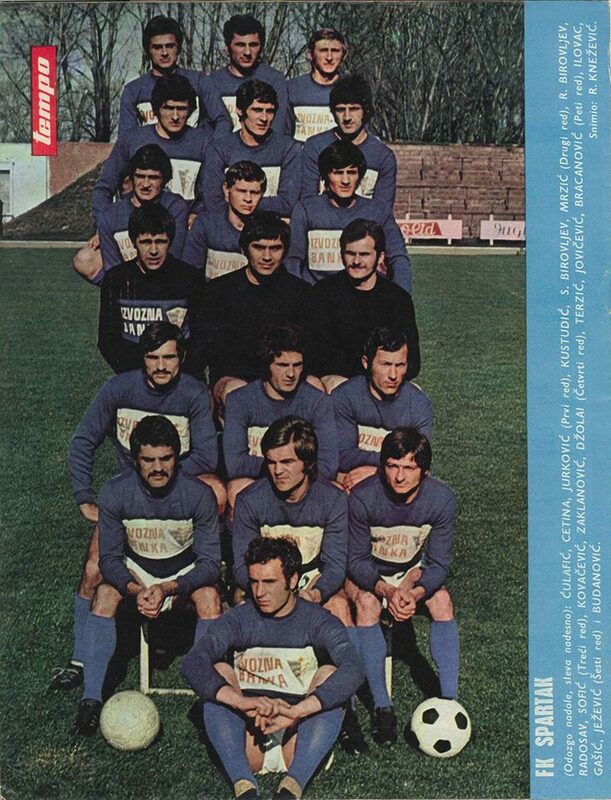 Subotica and FK Spartak in particular, were regarded at some point as “good footballers true breeding ground”. 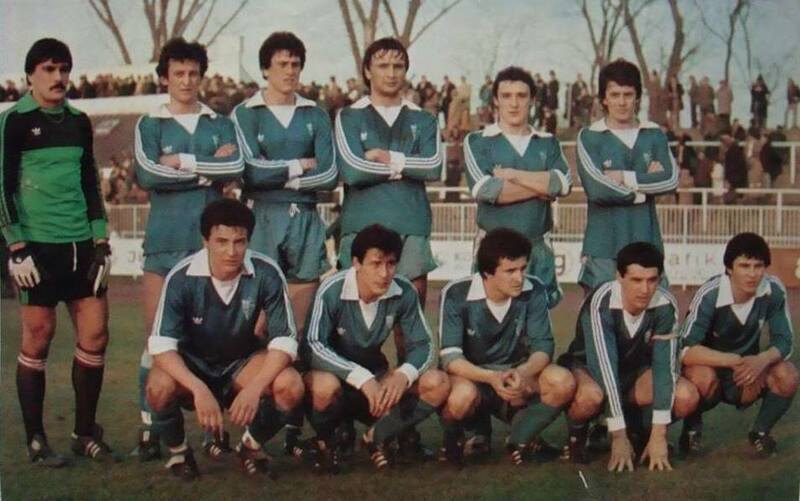 Therefore, it`s no wonder lots of Subotica-born players performed for number of Yugoslav post-WWII football clubs and all of them played a significant role – Tihomir Ognjanov, Joska Takac, Bela Palfi, Lajco Kujundzic, Ivan Zvekanovic, Antun Rudinski, Dusan Maravic and Stevan Ostojic at Crvena Zvezda, Lajco Jakovetic, Stipan Kopilovic, Bela Palfi, Anton Rudinski, Anton Tapiska, Gustav Matkovic, Silvester Seres at Partizan, Ivan Zvekanovic, Jakov Stantic, Antun Tapiska, Djordje Palatinus, Bratisa Branisavljevic and Jovan Bistricki at Nasa Krila (military air-force team), Lajco Kujundzic, Ilija Vorgucin, Josip Prcic, Jakov Stantic, Djordje Palatinsu, Ivan Latki and Vilim Gemeri at Mornar (navy forces team), Istvan Pletl, Gustav Matkovic, Silvester Seres, Jozef Fabri and Josip Zemko at Vojvodina, Milos Cetina, Dusan Jurkovic, Vladimir Culafic at Borac Banja Luka. 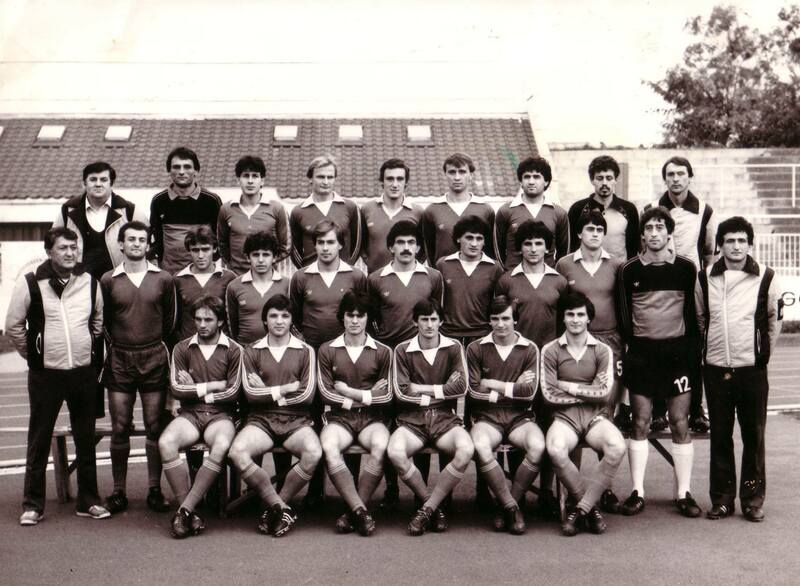 With time, Spartak would also sign number of Yugoslav players from other clubs: Kosta Tomasevic, Nikola Prvulovic, Dimitrije Tadic and Bata Pantelic from Crvena Zvezda, Aleksandar Joncic, Gradimir Bogojevac and Dragoslav Jovanovic from Partizan, Ranko Leskov, Radivoj Radosav, Dobrivoje Trivic, Dusan Stakic, Milenko Dragojevic, Rajko Kvacevic, Mile Vrga and Branimir Novakovic from Vojvodina, Kadra Abadzic and Stjepan Kadovic from Proleter/Osijek, Dimitrije Stefanovic, Milorad Popovic and Milos Jovanovic from Macva Sabac and Zvonimir Rasic from Proleter Zrenjanin. 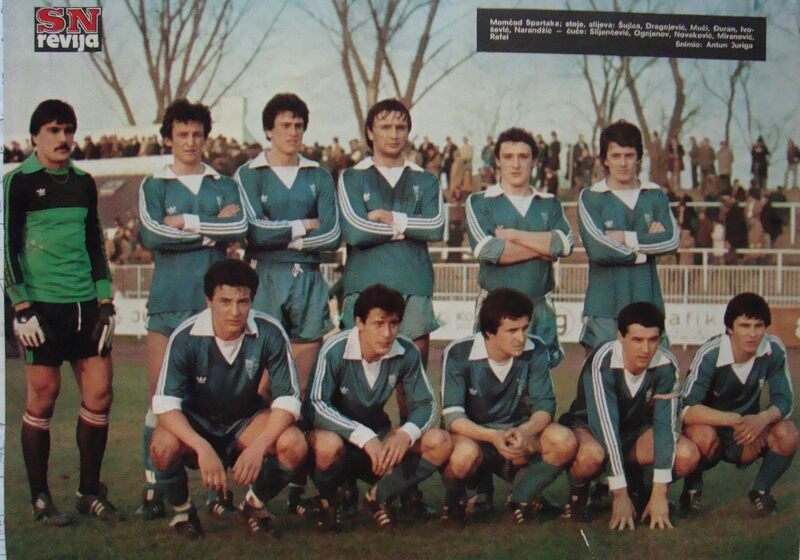 Among Yugoslav national team players many of those were from Subotica and Spartak. 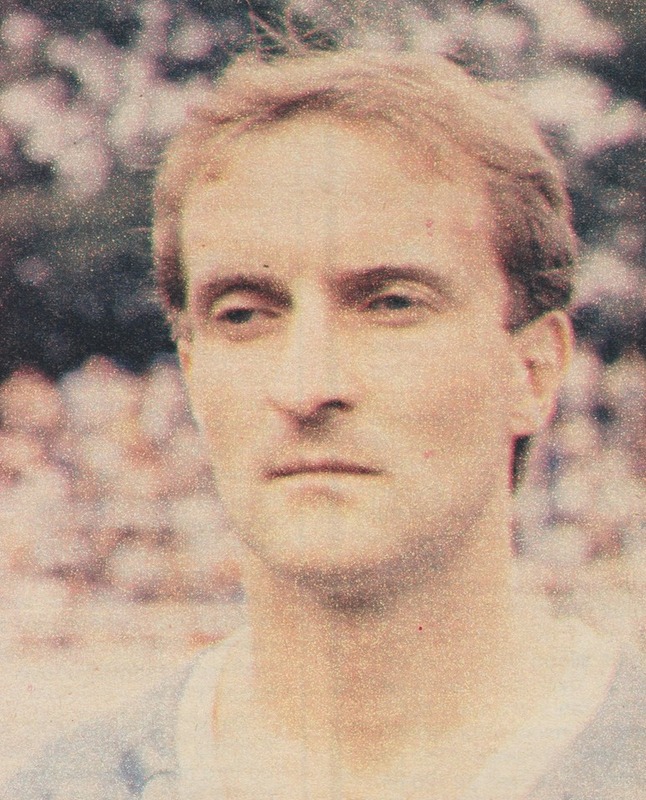 Andrija Kujundzic was first Subotica-born footballer to play for national team. 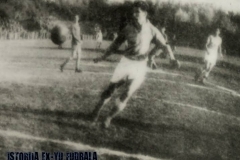 He made his international debut on 28th of October 1921, in a 6-1 Yugoslavia defeat to Czechoslovakia away in Prague. 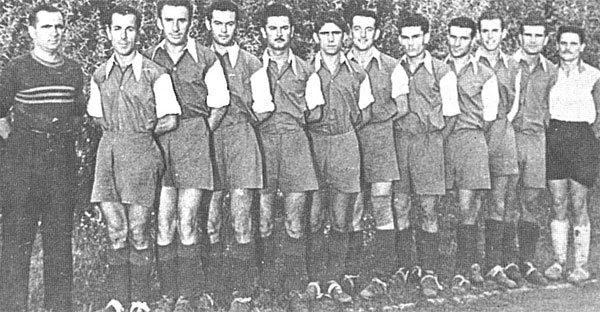 Prior to WWII, Josip Horvat, Mihalj Keckes, Milos Beleslin, Jovan Beleslin and Geza Siflis were also part of Yugoslav national team. 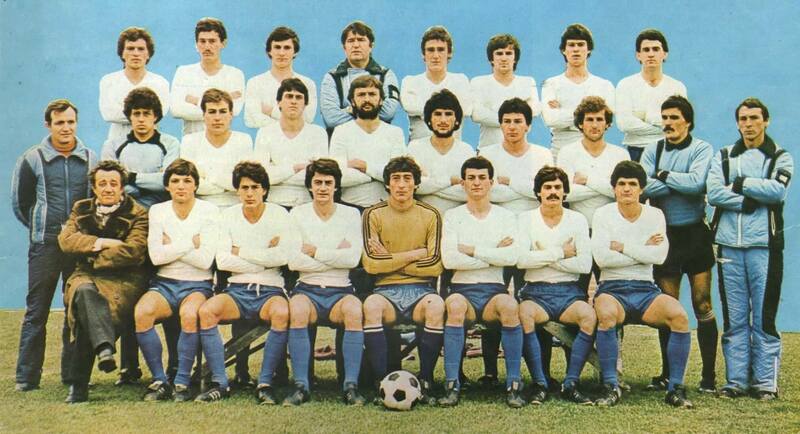 Upon liberation, a number of Subotica-born players took part in various national selections (Yugoslavia A, Yugoslavia B, Olympic team and Yugoslav youths): Tihomir Ognjanov, Joska Takac, Lajco Jakovetic, Stipan Kopilovic, Antun Rudinski, Stevan Ostojic, Miloš Gloncak, Dušan Maravic, Josip Zemko, Stevan Tonkovic, Rade Maravic, Ilija Takac, Mihalj Jezevic, Slobodan Sujica, Ivan Budanovic, Dusan Jurkovic, Milos Cetina. 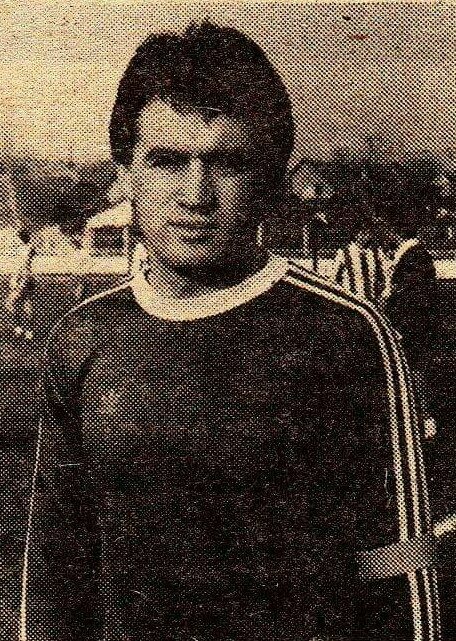 Tihomir Ognjanov holds a record for number of appearances among Subotica-born players, he played 28 Yugoslavia A and 2 Yugoslavia B matches. 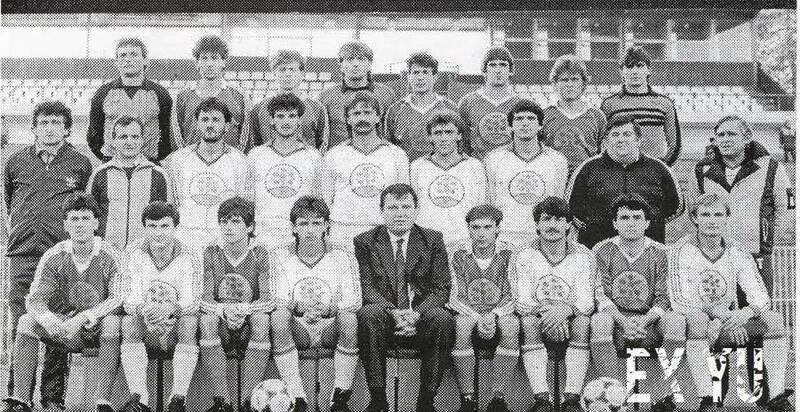 It`s worth to mention participation of Spartak players in other national selections – notably Yugoslav Railway and Labour Union national teams. 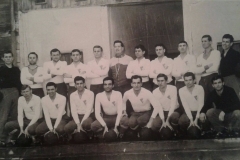 Between 1947 and 1952, these national teams were regular fixture of European Championships, often picking up winners trophy. 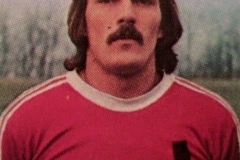 Spartak players involved were: Milos Gloncak, Gojko Janjic, Stipan Kopilovic, Miroslav Beleslin, Joska Takac, Bela Palfi, Silvester Seres, Bratisa Branisavljevic, Antun Tapiska, Jozef Gemesi and Ilija Vorgucin. 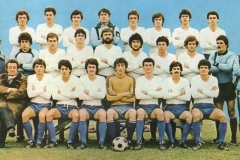 A TEAM: Milos Gloncak, Stipan Kopilovic, Balaz Cikos, Janko Zvekanovic, Miroslav Beleslin, Lajco Jakovetic, Gojko Janjic, Joska Takac Tihomir Ognjanov, Antun Rudinski, Silvester Seres. 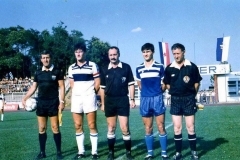 B TEAM: Pajo Simokovic (Ivan Kampa, Blasko Milunovic) – Antun Tapiska, Ivan Bogesic (Roko Vojnic), Dimitrije Stefanovic (Jakov Stantic), Stevan Copic – Bela Palfi (Ladislav Jenovai),Lajco Kujundzic (Ivan Latki), Jozef Gemesi (Sandor Cikos, Ranko Leskov) – Radivoj Azucki (Gradimir Bogojevac), Ilija Vorgucin, Bratisa Branisavljevic ( (Josip Prcic). 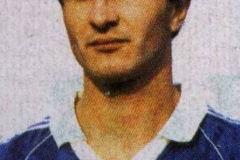 C TEAM: Djordje Zaklanovic (Stjepan Kadovic, Tomislav Tausan) – Zvonimir Rasic, Drago Jovicevic, Milos Cetina, Bozidar Gasic – Dusan Maravic (Dušan Draskovic, Mihalj Jezevic, Radivoj Radosav (Grgica Covic, Stevan Birovljev, Laslo Borbelj) – Dusan Jurkovic, Vojislav Tonkovic, Nikola Vukomanovic. 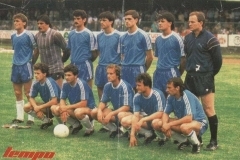 D TEAM: Dragan Popovic, Slobodan Sujica, Tomislav Martinovic, Ernest Kovacevic) – Slobodan Bracanovic (Rudolf Rafai), Nedeljko Cuckovic, Tomo Peic (Mihalj Bleskanj), Cedomir Terzic (Jozef Agoston) – Zivko Slijepcevic (Kadro Abadzic), Micko Djukanovic (Mile Vrga), Dragan Miranovic – Djordje Terzic (Branimir Novakovic), Stevan Vitkovic (Slobodan Kustudic), Matija Hirsman, Jozef Fabri (Josip Simokovic). 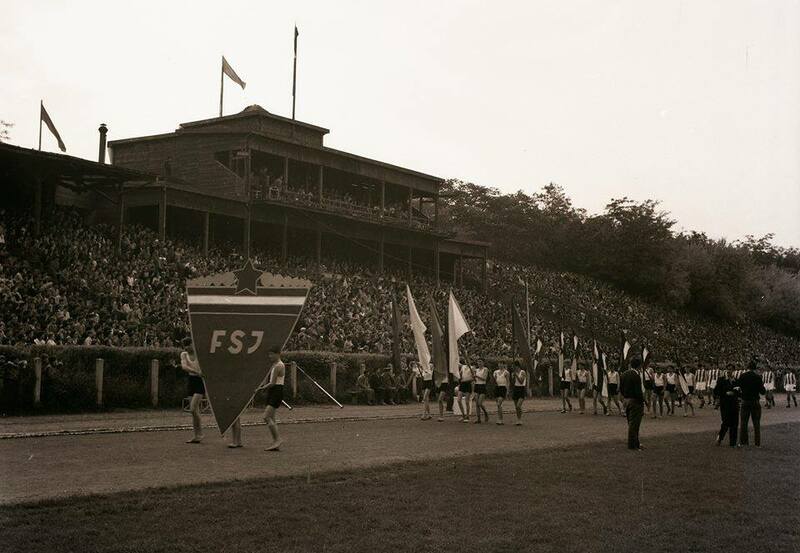 Just before Subotica`s WWII liberation, fascists were looting anything of value on their way out and there was a great danger that athletes would be dispossessed ot their precious equipment too. 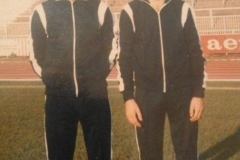 Knowing what might happen, a group of footballers, among them Lazar Bogesic, Pajo Simokovic and Stipan Kopilovic, decided to save their equipment from being looted. 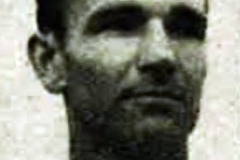 One day, they transferred their equipment in a carefully camouflaged cart over the Paja Simokovic`s backyard and hid it in a specially-constructed shelter. 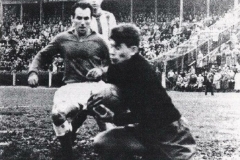 Due to their action, players had no training problems during the early liberation days. Similarly effective and quick action was also taken by a group of football players, this time with help of their wives, end of April 1945, when the whole of Subotica was preparing for the 1st of May parade. Night before the celebration, Chief of OZNA (The Department for People`s Protection) Viktor Vrhovec secured blue and white linen for football equipment manufacture and manic and outstanding sewing of new and appropriate football shirts and shorts in Spartak colours commenced. In those early post-WWII days, lots of athletes took part in different sports. 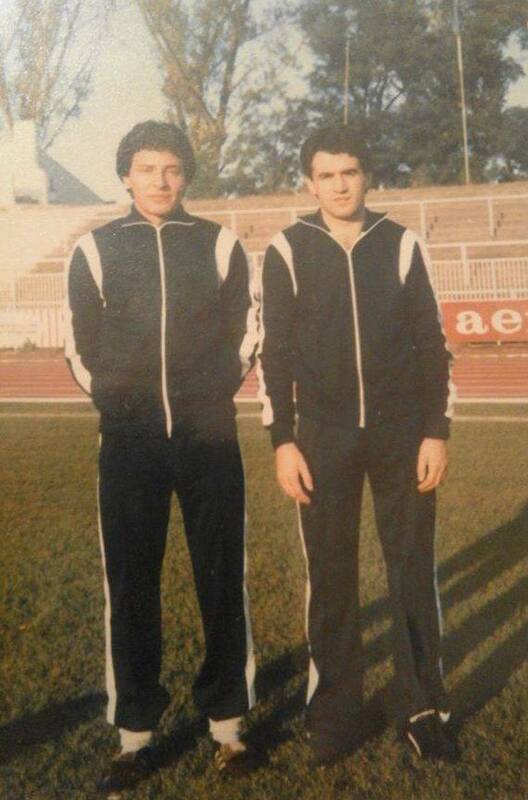 One of them was Vilim Harangozo, a table tennis and football player, later to become a world tennis player champion. 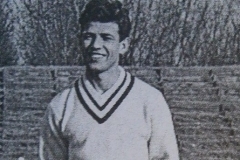 He was also playing as a Spartak centre-half on number of occasions, even scoring in the first ever top-tier Spartak game, a 3-1 defeat to Crvena Zvezda. 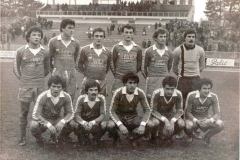 Spartak would often play abroad, most often in Romania. 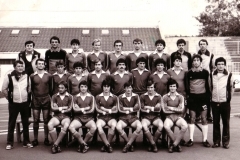 Over the space of several decades, Spartak visited Romania more than 20 times. 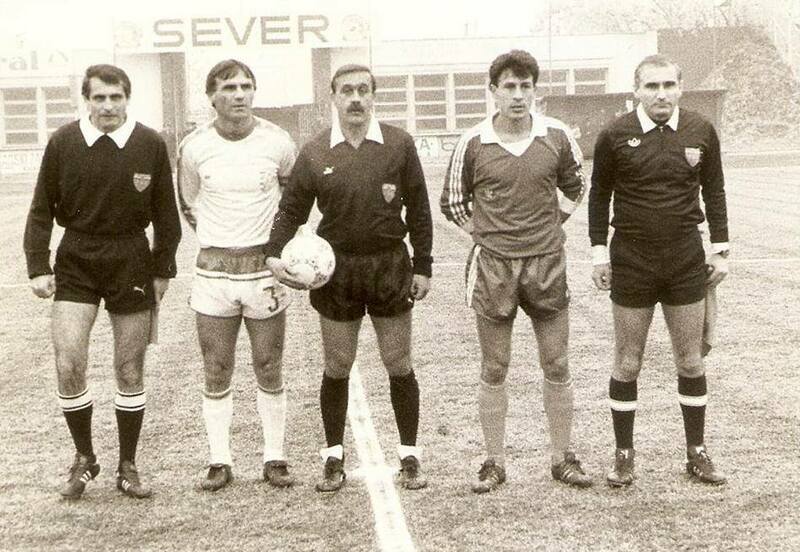 These Romania tours were organized by prominent sports operative Mihajlo Sele. A number of former Spartak players took up coaching and some of them plied their trade abroad. 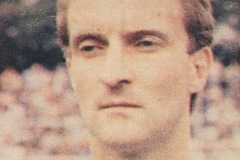 Janko Zvekanovic enjoyed the longest spell coaching abroad, Zvonimir Rasic coached Australia at 1974 WC in Germany while Djordje Palatinus, Dusan Draskovic and Petar Popovic also worked abroad. 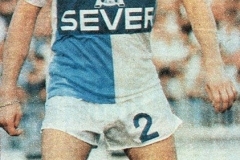 Dezider Marton of Sever Subotica is also worth a mention but as a player – he was twice top goalscorer and once best player of the year in Australia. 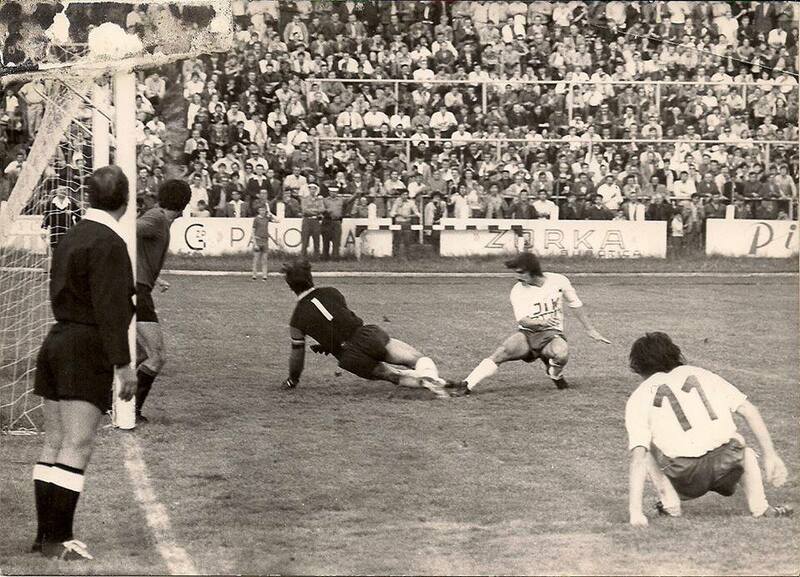 We witnessed some unusual goals in Subotica too. 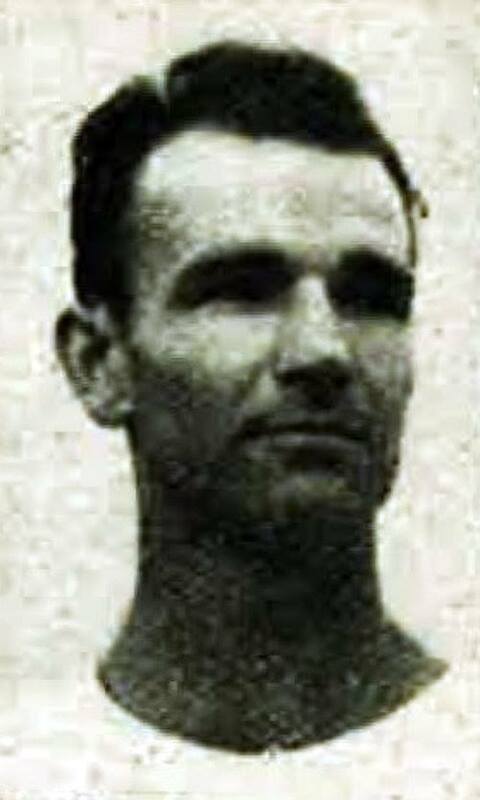 In 1945, Janko Zvekanovic scored a half length of the pitch goal against Gradjanski. 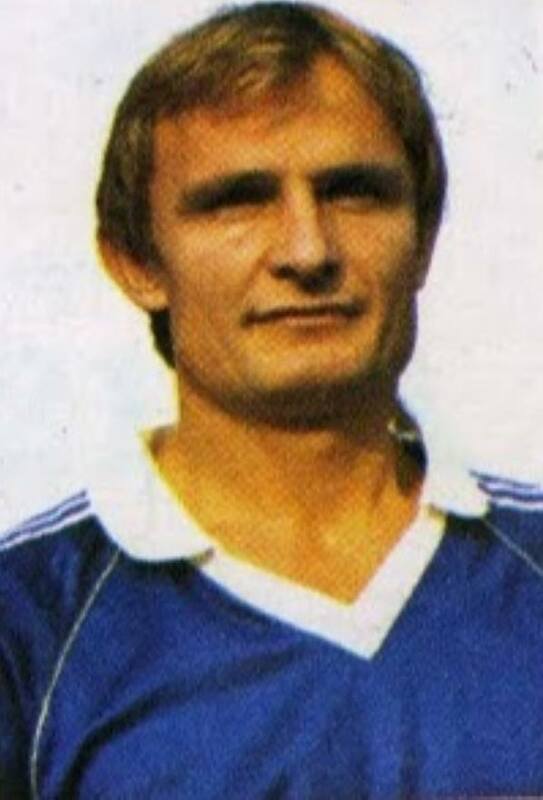 Even more unusual was a goal scored by Dusan Jurkovic of Sever Subotica in 1980, in a game against Hajduk Beska – his teammate Dezider Marton assisted to him with the first kick of the game followed by an instant shot and goal from Jurkovic, one of the fastest goal in football history. 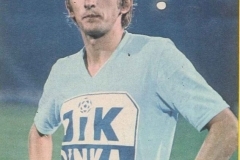 We remember moments of football tragedy too – Ranko Leskov missed a penalty in a home goalless draw againt Rijeka in 1958 and Dusan Jurkovic missed it in a one-all draw against Sloboda in 1973, both penalty misses leading to Spartak being relegated to second-tier. 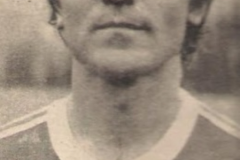 There are number of Spartak players who will be remembered as great football maestros, skippers, outstanding athletes, playmakers, goalscorers or even a true legends. 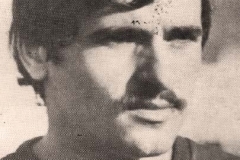 One of them was goalkeeper Milos Gloncak. 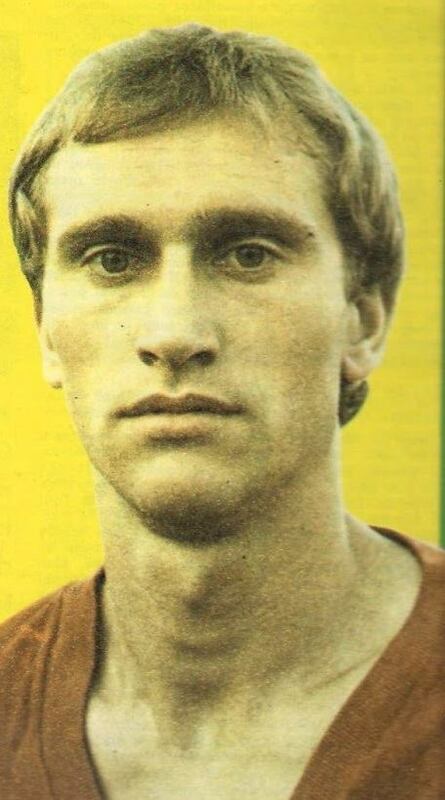 He was among the top Yugoslav shotstoppers for a number of seasons. 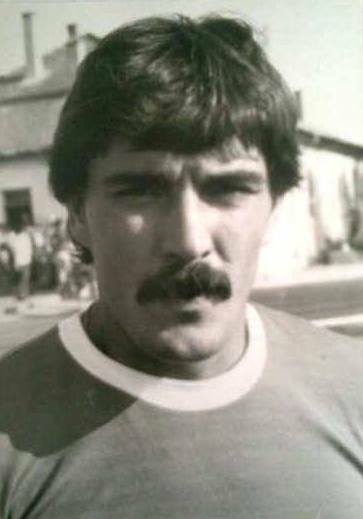 Over the course of 22 years as Spartak player, Gloncak even played as a forward and proved prolific striker too. 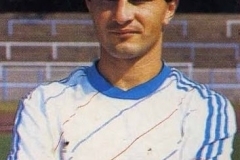 Tihomir Bata Ognjanov is Yugoslav football legend, the most accomplished and best football player Subotica ever had. 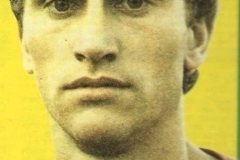 In times of legendary Stjepan Bobek, the most subtile and technically-gifted Yugoslav player, Spartak`s Josko Takac was right next to him quality-wise. 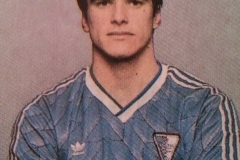 Stevan Kopilovic, Janko Zvekanovic, Lajco Jakovetic, Ivan Bogesic and Antun Tapiska were lads of great fighting spirit, the most reliable defenders one could have. 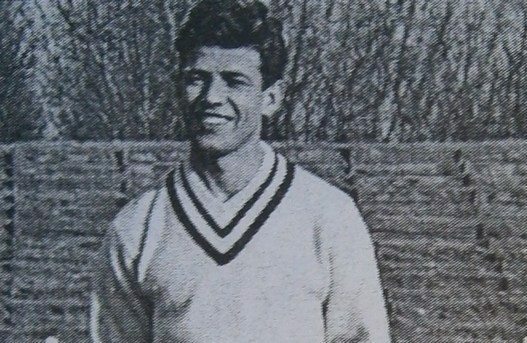 Apart from Ognjanov, who was capable of scoring with his feet and head equally, Antun Rudinski was another outstanding Spartak forward whose talent is unequalled to this day. 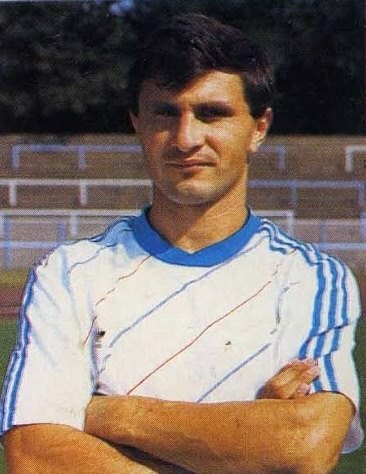 One of the Subotica football scene favourites is Gojko Janjic, Spartak players with the most appearances for the club. 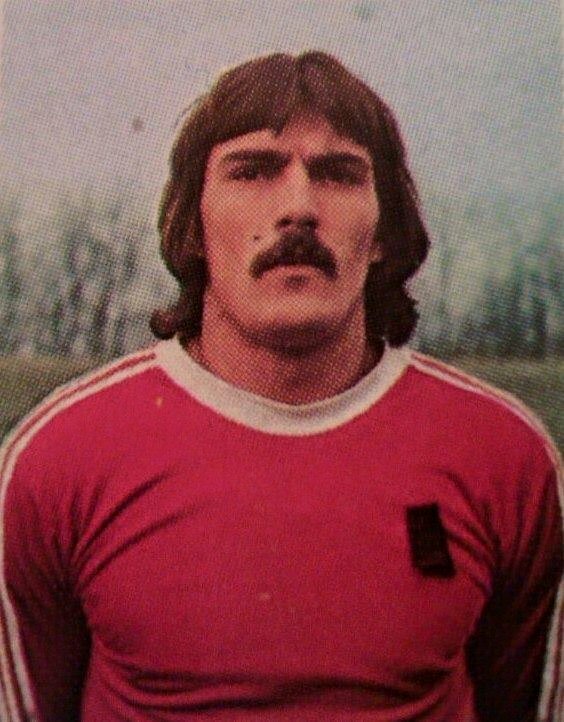 Spartak had great team captains too, but the one who wore the skipper`s armband for the longest time was Drago Jovicevic. 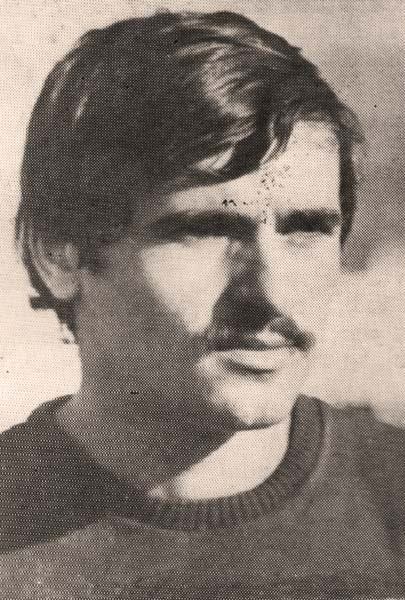 Here`s the list of Spartak players with the most top-tier appearances: Milos Gloncak (146 apps), Stipan Kopilovic (141), Joska Takac (133), Antun Tapiska (130), Bratisa Branisavljevic (125), Ivan Bogesic (112), Tihomir Ognjanov (110), Lajco Jakovetic (106), Cikos Balaz (102), Stevan Ćopic (93), Ladislav Jenovai (69), Josip Prcic (66), Ilija Vorgucin (63), Ranko Leskov (61), Lajco Kujundzic (57), Gradimir Bogojevac (55), Vilim Gemeri (52) i Jozef Gemesi (50). 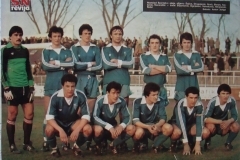 Presidents: Viktor Vrhovac, Laza Bogesic, Ivan Stevura, Josip Konovec, Marko Baclija, Miklos Sabo, Rudolf Jontovic, Ivan Vracaric, Antun Milankovic, Franjo Nadj, Madimir Djanic, Milan Galovic, Lazar Kopunovic, Blasko Kopilovic, Grgo Kolic, Misko Covic, Pal Barkanj, Milan Jaric, Andrija Bukvic, Stevan Pap, Tomislav Karadzic, Imre Der. 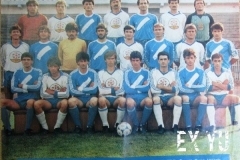 Coaches: Martin Takac, Aleksandar Zvekan, Miro Stojanovic, Miska Held, Franjo Glazer, Mosa Marjanovic, Branislav Sekulic, Jozef Nemet, Stipan Kopilovic, Ilija Rajkovic, Ladislav Varga, Lajco Jakovetic, Tihomir Ognjanov, Joska Takac, Ivan Zvekanovic, Dusan Draskovic, Dusan Maravic, Dejan Vrana, Vlatko Konjevod, Laslo Borbelj, Zarko Nedeljkovic, Joakim Vislavski, Milan Zivadinovic, Luka Malesev, Boris Maravic, Ivan Brzic, Stevan Ostojic, Josip Zemko and Milan Ribar. 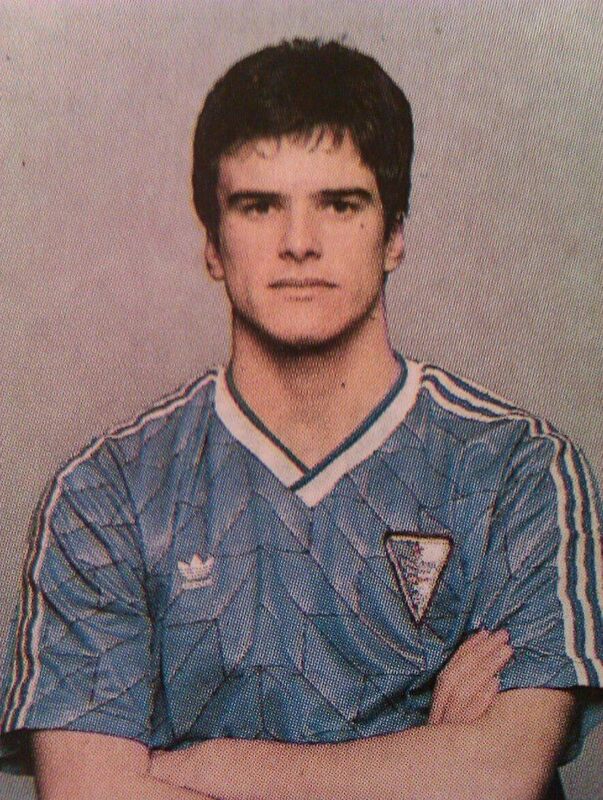 Surely, Tthe biggest authority among Spartak coaches was Branislav Sekulic. 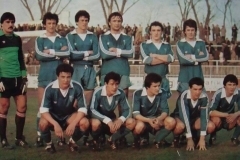 General Secretaries: Stipan Kopilovic, Ilija Vorgucin, Petar Markovic, Grga Temunovic, Mihajlo Sele, Lazar Vasiljev, Koloman Stipic, Milan Pesut, Ivan Herman, Luka Katic, Jozef Nadj and Svetozar Mirolovic. 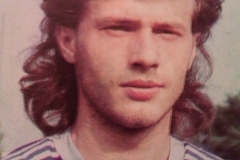 Technical Directors: Radivoj Sibalic, Aleksandar Zvekan, Milojko Stavljanin, Dezider Lulic, Jozef Balaz, Gojko Janjic, Momir Mijatov, Josip Neorcic, Svetozar Pusin, Karlo Tonkovic, Jakov Stantic, Ranko Leskov, Petar Malagurski, Svetozar Mirolovic, Aleksandar Stojkovic, Aleksandar Malusev, Tihomir Ognjanov and Jovan Popov. 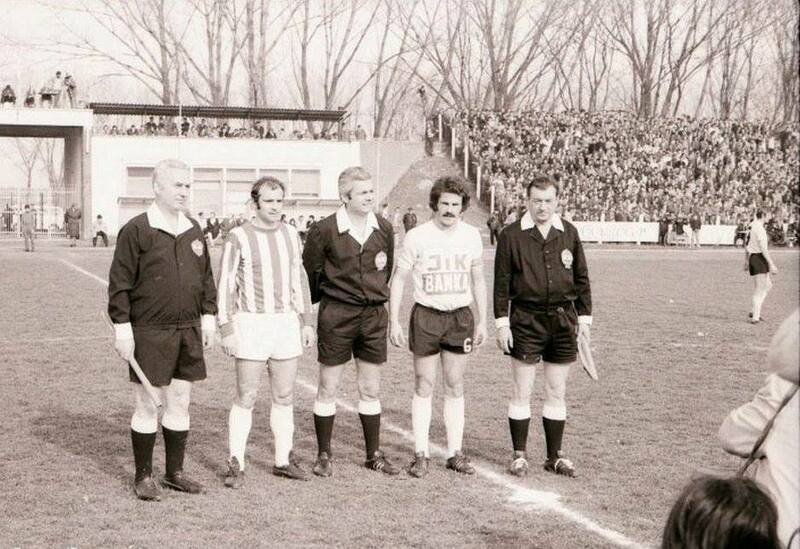 We`d like to thank Subotica Sports Association official website editors for allowing us to use their data. 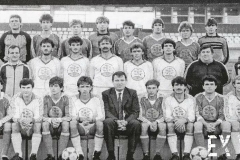 During the late 90s and early 2000s, Spartak was going through toughest times in the long and rich history of the club. Close to being relegated to fourth-tier, financially close to bankruptcy, Spartak was almost about to fold. 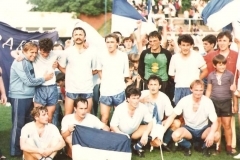 At the same time, FK Zlatibor Voda Horgos was enjoying great results and financial stability, climbing up the Serbian division ladder. 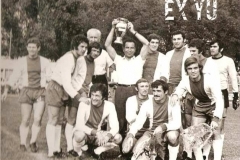 By the end of 2007/2008 season, Spartak stopped competing in senior football competitions with only Spartak youths engaging in their respective competitions the following season. Due to massive financial troubles and accumulated debts, Spartak had to declare bankruptcy in 2010. 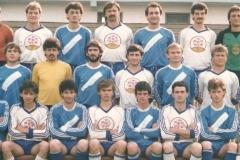 After Subotica public pressure, prior to 2008/2009 season, FK Zlatibor Voda changes its name to FK Spartak Zlatibor Voda and FK Spartak club crest was additionally stylized and changed in 2011. 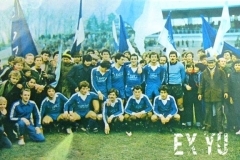 FK Spartak Zlatibor Voda won promotion back to top-tier in 2010 and as such, Spartak is still integral part of Subotica life. New club won two back-to-back promotions and debut 2010/2011 top-tier season saw Spartak winning 4th place and European competiton qualifiers. Spartak beat Luxembourg outfit Differlange in UEFA Europa League qualifiers round 2 followed by narrow two-legged defeat in the hands of Ukranians Dnipro, far more stronger club compared to Spartak budget-wise. In June 2013, club changed name back to FK Spartak after unanimous club assembly decision. Before the 2015/2016 season kick-off, Spartak signed a four-year technical sponsorship contract with LEGEA, Italian sports equipment manufacturer. New general sponsorship contract was signed prior to 2016/2017 season. 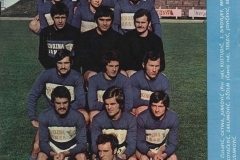 Renowned Vinarija Coka company signed a two-year deal with the club and FK Spartak changed name to FK Spartak Zdrepceva Krv, adding one of the top Vinarija Coka brands to club`s name. Spartak won Serbian Super League final standigs 4th place in 2017/2018 season, qualifying for UEFA European competitions once again. Following 2018/2019 season, Spartak eliminated Northern Ireland side Coleraine 3-1 on agg (1-1 home, 2-0 away) in Europa League round 1, followed by elimination of Sparta Prague in round 2 qualifier 3-2 on agg (2-0 home, 1-2 away). In round 3, Spartak locked horns with Danes Brondby and lost 4-1 on agg (0-2 home, 1-2 away). Spartak actually played all mentioned UEFA competition home games at Novi Sad`s Karadjordje Stadium (Differdange 03, Dnipro, Coleraine, Sparta) and Belgrade`s Rajko Mitic Stadium (Brondby) as club`s home ground failed to meet UEFA stadium regulations licence.